Kristen graduated from UMass Lowell in 2014 with her M.A. certificate in Clinical Pathology and in 2018 with her Doctorate of Physical Therapy. 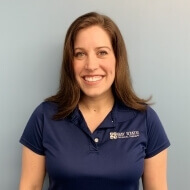 Kristen has clinical experience in areas of spine & sports, aquatics, and neurological therapies. She believes in a holistic approach to patient care in order to treat the whole person, not just the condition. Kristen is married with 3 kids, a Labmaraner dog, and a Jardine’s parrot. She always keeps busy with new hobbies like speaking Spanish, training her dog to be a therapy animal, and running a marathon. She travels all over the world, but always comes home to New England, GO SOX!